Ya Jagoff!!! | Perpendicular vs. Parallel Parking? Home Parking Jagoffs Perpendicular vs. Parallel Parking? I think my man got a little confused over terms perpendicular and parallel in geometry class! Perhaps they parked before the fog lifted? If so, seems to me that those posts would have a ding or two on them. Perhaps they had Mr. G###, the same geometry teacher that I had, and slept through the class more than ol’ Mr. Grega? C’mon, big-rigger-Ricky, cargo tray or not, take that little-good-for-nothing-not-even-to-help-a-friend-move-a-bed-frame-and-a-lamp-or-TV and put it parallel with the lines, or has Mr. G### would have explained it “zzzzzzzzzzzzzzzzzzzzz…hmm…hmmm….hmmm…. snort….zzzzzzzzzzzzzzzzzzzz” Ya Jagoff! Thanks to @dylangleche on Instagram for being our Honorary Jagoff Catcher. The SUPER BOWL of Jagoff Parking! 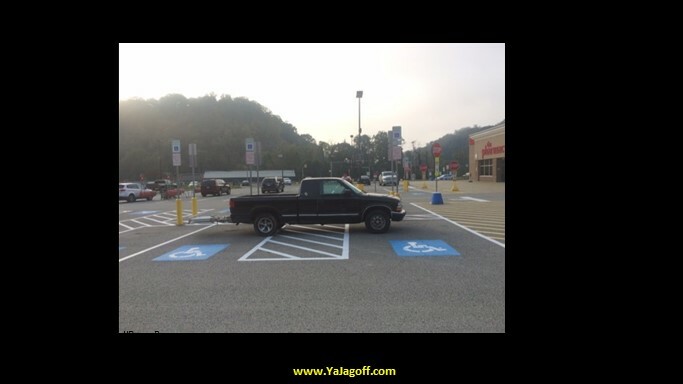 Handicapped or Jagoff? You Make The Call!